So, Jthbeaux and I are now officially an all-streaming household. Those Netflix discs were just sitting there for months lately, the evil Comcast finally turned off my cable entirely, the antenna doesn't get NBC, and the EyeTV just stopped working. The Apple TV is working fine, but the first generation has only YouTube and Flickr as apps, so it's mostly an iTunes content delivery device. I thought I'd try something new, so I bought a Chromecast, since it was only $35. I have my iPad Mini by my side all the time, anyway. We decided to get Huluplus, since the Chromecast supports it and it's actually $2 less than the Netflix disc subscription, so a net savings. Finally, I can watch new shows on my schedule without the risk of the recording going wrong, and without a lot of space taken up on my hard drive. You do have annoying commercials, but the HD is great, and since I'm addicted to The Colbert Report and The Daily Show, it also saves me money not having to buy them from iTunes. Netflix also looks better than on my old Blu-ray player, and it's much easier to search for things using the mobile app. The main issue I have with Chromecast is that using the iPad Mini as a remote is not as smooth as my trusty Logitech Harmony remote, It could also use more apps, though it's still new, so I'm sure they will come. Then, my old Blu-ray player was getting wonky, but my parents were kind enough to get me a new Samsung for a present, It has Amazon Instant Video (I already had an Amazon Prime subscription for the sweet free 2-day shipping) in addition to to Netflix and Huluplus, not to mention many other apps, and the streaming interface is much better than my old one. I think I'll use it for most of my viewing, because I can use my universal remote. It also lets you cast from the Youtube mobile app, which is good because typing with the remote to search for a video is a pain. 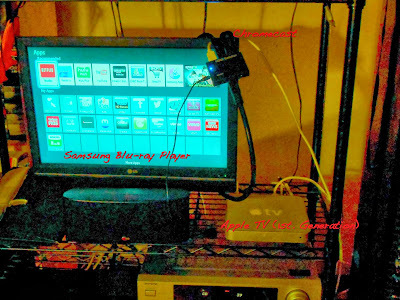 I still like my old AppleTV for streaming Internet radio, listening to my music, and sharing my photos. It's weird that neither the Chromecast or the Samsung have radio apps other than Pandora. It's also nice to have in case there's something exclusive to iTunes. I'd still recommend Chromecast to someone who wants streaming on their TV but doesn't want to spend much. I'll keep it to see if more music apps come along (Spotify would be good). For movie and TV shows not on streaming, we get a lot of them from the library anyway, so we'll keep doing that. If I'm OK with waiting, Can I Stream It? will notify me when it's available. We have it all! I just wish that some networks would not withhold their shows from streaming. Person of Interest is pretty awesome, but it is certainly not better than Almost Human or Nikita which can be streamed. As far as devices go, I am most thrilled with the Samsung, as you don't need the tablet to access it and it seems to glitch less than Chromecast. Between the library and our streams entertainment has not been lacking this cold winter!